We would like to thank the many supporters of our Indiegogo crowdfunding project to restore the 1933 Standard Superior Type 1! We were able to collect €14,247 or 32% of our goal during the timeframe given by the Indiegogo platform. Together with some additional donations and funding we were able to realize our ambitious project. The 1933 Standard Superior is now almost fully completed, with just some details left to finish. In the fall of 2017 we were introduced to the Firma Mebero s.r.l., Dr. A. Bilciurescu in Cluj, Rumania – a highly professional restoration company that works for many international clients including car museums. The company made us a very good offer to fully restore our 1933 Standard Superior at a very attractive rate. We took them up on their offer and have officially started restoration in September 2017. Next to support from Firma Mebero s.r.l. in Cluj, Rumania, Dutch company Jacobs NCI is supporting us by rechroming original parts and details of the car free of charge. Dutch journalist & writer Paul Schilperoord met Lorenz Schmid, a Swiss-born relative of Josef Ganz, when he was researching for the biography of Josef Ganz – and together we bought the Standard Superior. 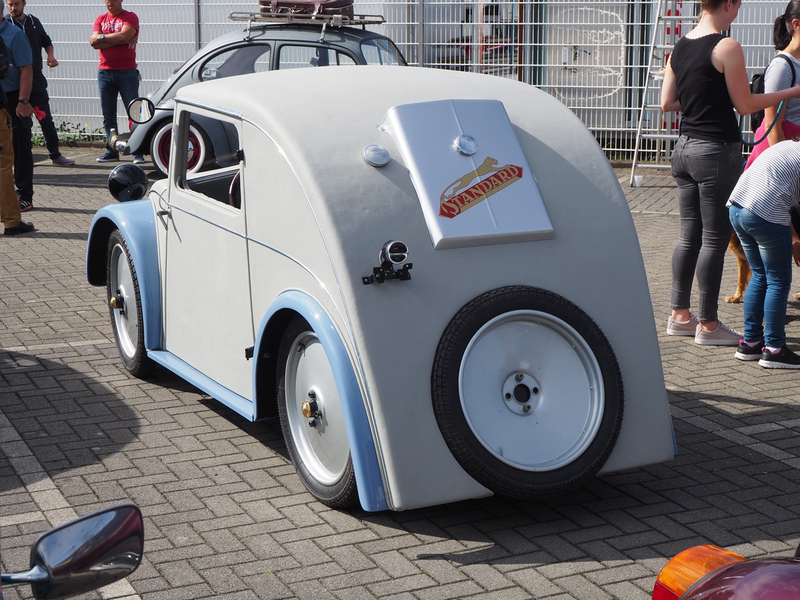 The aim of our campaign is to raise funds to recreate the original beetle-shaped bodywork for this chassis – working with professional restorers. If we are successful, the restored Standard Superior will be used in future international exhibitions & events to promote the work of Josef Ganz (1898-1967). Step 1: take the existing bodywork off the chassis and clean up or renovate original parts, such as chassis, wheels and wings. 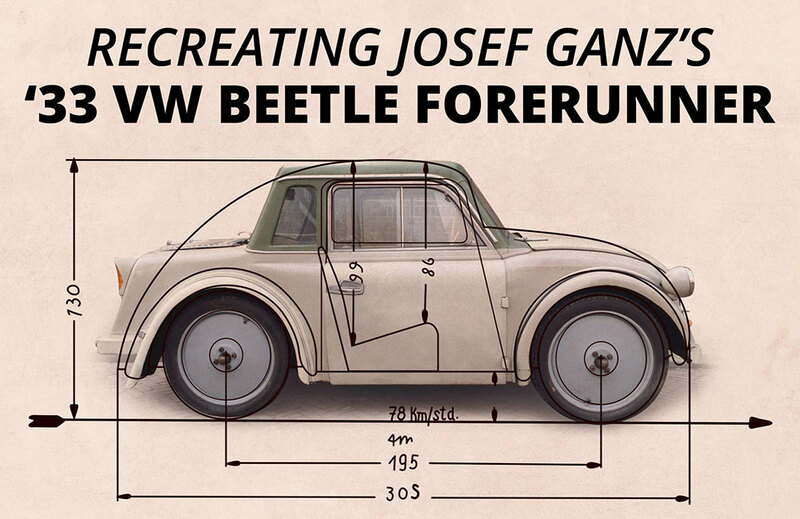 Step 2: the wooden bodywork will be reconstructed by a wood craftsman – using many original photographs from the Josef Ganz archives – and their associated partners will install artificial leather covering the wooden bodywork, do the paintwork and install windows and interior trim. Step 3: locate and install missing parts, such as original lights, steering wheel, dashboard switches, door handles, radiator, etc. 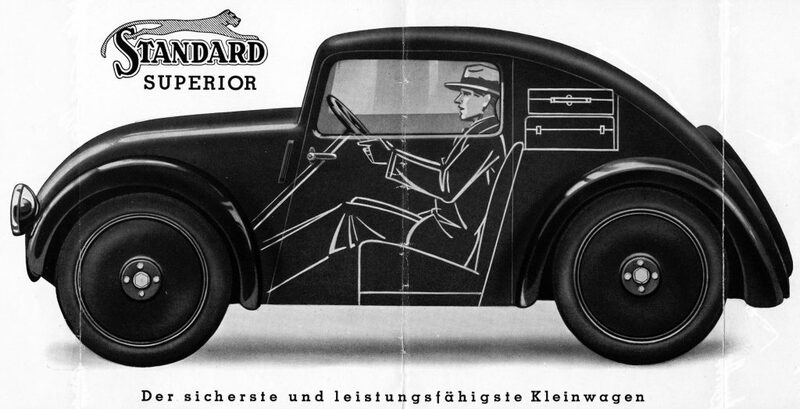 The Standard Superior is the embodiment of Josef Ganz’s propaganda campaign “For the German Volkswagen”. As editor-in-chief of Motor-Kritik magazine, he outlined the specs for this future car: low-slung, streamlined, backbone chassis, rear-mounted engine, fully independent suspension with swing axles – and a price not exceeding 1,000 Reichsmark. 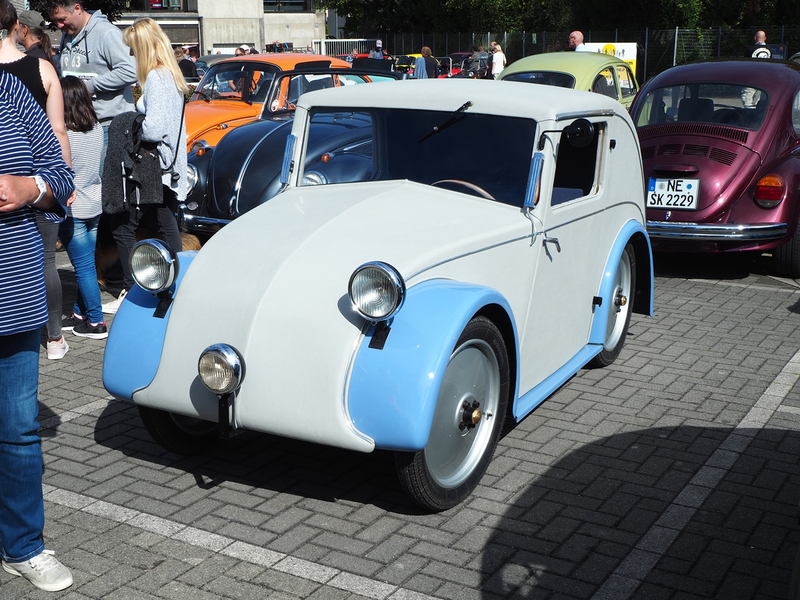 Ganz initially built two prototypes: the 1930 Ardie-Ganz and 1931 Adler Maikäfer (May Bug). As a technology demonstrator, the May Bug (see video above – with Josef Ganz behind the wheel!) inspired the industry to develop radical new prototypes – including the Mercedes-Benz 120, Tatra V570, Zündapp Type 12 “Volksauto” by Ferdinand Porsche, and Standard Superior based on the patents of Josef Ganz. 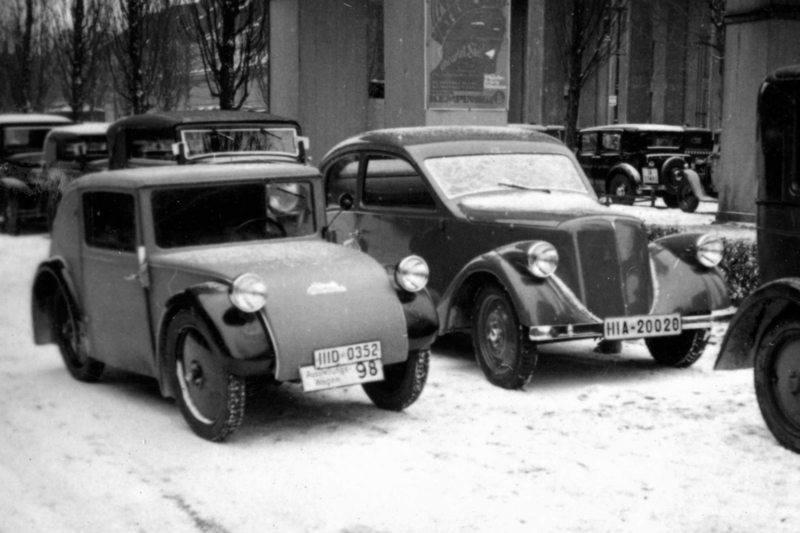 Exhibition model Standard Superior (left) next to the Zündapp Type 12 “Volksauto” prototype by Ferdinand Porsche (right) outside of the 1933 IAMA in Berlin. 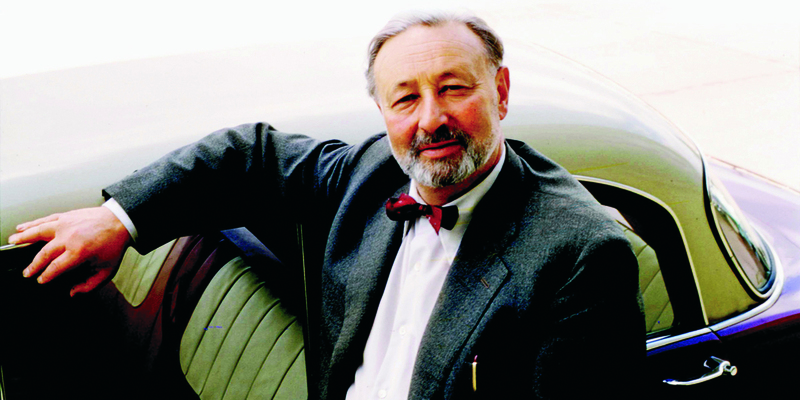 A journalist for The Detroit News concluded: “Whatever may be the future development of this type of car in Germany, without doubt the Hitler government will be responsible for its popularization.” Although Hitler would indeed popularize the “Volkswagen”, even the most prophetic journalist could not have foreseen that in the process he would deliberately erase the visionary Jewish engineer Josef Ganz from history. We plan to work with specialists to recreate the original shape of the bodywork based on period photographs and a surviving original Standard Superior Type II. This car has different body styling but a similar overall construction. A number of the original parts we need to find are electrical parts. 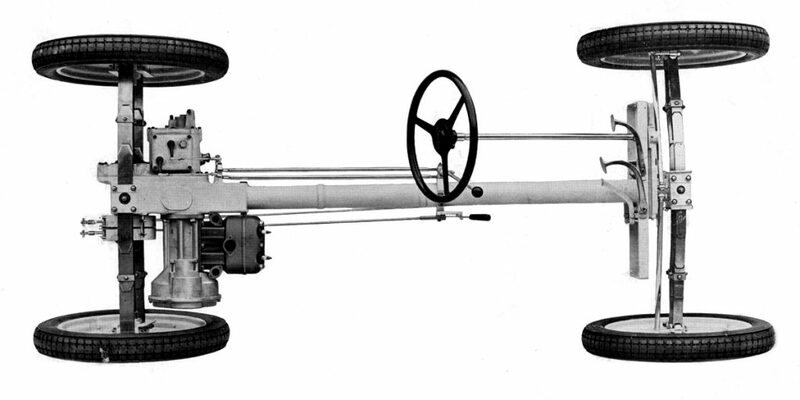 Standard exclusively used parts by Bosch, which already was a well-established company at the time. We plan to make regular trips to specialized events for pre-WWII cars, such as the VETERAMA, to search for missing parts.